Last evening I did my regular service as a Veil Worker in the Bountiful Temple of the Church of Jesus Christ of Latter-day Saints. It is one of the great blessings of my life. I have no intention of discussing sacred ordinances. They are sacred to me in a covenant with God sort of way. There are many scholarly and not-so-scholarly writings on the various subjects and that's not what this is about. What I want to say, with some caution so as not to unnecessarily trivialize Temple service, is how amazing it is to work in the Temple. Back in my olden days when we lived near Baltimore, Washington DC was our Temple. The Temple District covered the East Coast and a ways west as there were no other functioning Temples in the US east of the Mississippi at that time. (East of the Mormon Corridor in the Intermountain West until Dallas in 1984 and Chicago in 1985.) Busloads of patrons would arrive at the DC Temple (in Kensington, Maryland), from all over the eastern US in those days. My Elders Quorum had a regular assignment on certain Saturdays to go serve in the Baptistry where busloads of youth would arrive to be baptized as proxies for those who had not had the chance while they were alive. We provided the priesthood brothers to baptize, witness, perform confirmations, and other duties as assigned. Then, soon after the Albuquerque Temple was dedicated, a Temple Worker in my Albuquerque Ward said to me that I should be a veil worker. All I had to do was present myself to pass off the words of ordinances at the veil and I could be set apart. It worked! As an aside, in Herod's Temple when Jesus was on the earth, only the High Priest could pass through the veil and enter the Holy of Holies symbolizing (maybe literally) the presence of God. 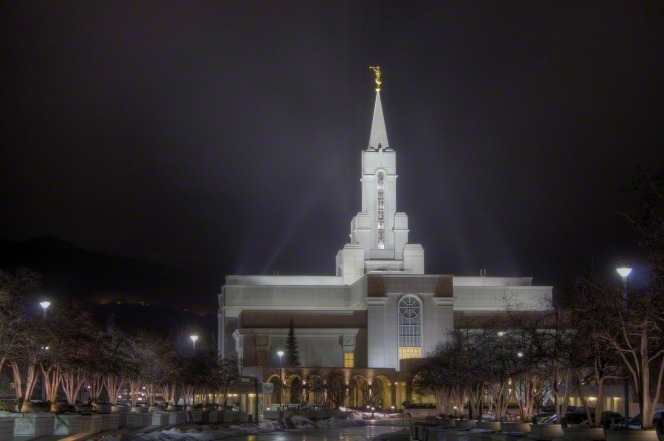 In modern LDS Temple worship, we receive an endowment of priesthood power from on high, men and women both, and passing the veil is symbolic again of entering the presence of God. A Veil Worker, as I currently am in the Bountiful Temple, has limited assignment to preform a very sacred ordinance at the Veil, hence the name. The interesting thing about the management of the Bountiful Temple is that they give us rotating assignments to help in other areas of Temple service. We assist in the Baptistry, just like I did in the old days in Washington DC. We also witness sealings, these are priesthood ordinances for men and women for married couples to be sealed together for time and eternity and for their children to be sealed to them. Our work is for the dead as living proxies serve in the place of their own ancestors or other names the Church has gathered. A regular Temple Worker is different not in any degree, but in availability. They are generally, but not always, older retired folk, men and women as women do perform some Temple priesthood ordinances. Their assignments are six-hour shifts as various times of the day. Veil Workers in Bountiful have four-hour shifts in the evening which makes in possible for people still fully employed, like me, to serve in the Temple. Once, retired, I hope to become a regular Temple Worker and take a couple of full shifts per week. In most Temples, and even in Bountiful, Veil Workers are called up to assist at the veil when they do regular sessions on behalf of the dead. The Bountiful system is great because we get more duties. Even towel folding duties in the laundry when the Baptisty is very busy, usually with youth, girls and boys from age twelve on up - and often adults when with their youth groups or doing their own family names. There is a slight distinction in dress between veil workers and regular Temple workers. We all dress in white. I wear a regular white shirt and long tie and white pants, white socks, and white slippers. The regular Temple worker have a full white suit, white long tie, white shirt, etc. We have name tags and the tags for veil workers identify that we are such. The regular workers, or "white jackets" in the nickname way, also have name tags. It is principally the white jackets that set us apart, the distinction being helpful as we have different parts of the service to perform at the veil. But my lowly station gets the best part, just sayin'. With all that background, what I was trying to get to was the downtime at the Temple. This is fascinating to me as an observer of people. All the people in the Temple are good people. We have to get a recommend from our Bishops that go through a list of self-certifying questions on our faithful commitment to basic principles of the Gospel and standards of conduct (the no alcohol, no sexual relations outside male/female marriage, no mistreatment of family or failure to fulfill obligations to family, etc.) And we come from a variety of backgrounds making it very interesting. With the standards of dress, all in white, it is a leveler of persons. At first glance, you can't tell what a person was or is professionally or what they do in their lives outside the temple. In the downtime waiting for a veil or waiting for patrons in the Baptistry or Sealing Office, sometimes those things come out. I kind of wish they wouldn't. I try to be as inconspicuous as possible. There are a few retired attorneys here or there. And once, I did have to reveal myself as a Democrat as the talk was very anti-Obama. Some may still remember that I had to tell some guys to go to heck (in temple-talk, that comes out even more bland and charitable) and they now treat me with loving respect. We are not supposed to bring discussions of the world into the Temple. It's just sitting around that they sometimes come up. And people know each other from the outside so sometimes these chats veer into those territories - or long convoluted discussions of how one is related to another or a lot of talk about missions, recent or from the old days of early adulthood. Sometimes foreign language becomes a topic as we try to always provide ordinances in a patrons native language if at all possible. I can do Portuguese or Spanish which come up now and then. The translations are different enough that I require a review of the cards carefully guarded by the shift coordinators or the recorder's office. The ordinances are presented with precision and memorized if at all possible. Although they are allowed to be read, or signed, or close-captioned for the portions on film. The goal is to present them in the most reverent and perfect way, memorized if at all possible, and just last week I did Portuguese smoothly (after checking the card). And I had done Spanish a couple of weeks before. My old Welsh friend hasn't returned yet from his mission to Wales so I can't practice that language (which sadly is not a Temple language - maybe in Preston, England???) Another guy I love to talk to works for the Church in the Family History Department. He is in charge of the scanning of records in the United States. That's a mission I'd like to do. The foreign needs seem to be in Africa and South America as Europe has been pretty well covered (except for Eastern Europe). This guy is also researching his Dutch ancestry which fascinates me as I have some too. He is genuinely interested in my stories of research and breakthroughs with my Welsh people. Then there are those you'd really rather not know were avid four-wheelers when not serving in the Temple with stories of crashes down mountains, etc. But that guy also hands out chocolate candies to the workers so it evens out. We are human beings and in spite of passing our recommend questions with our bishops, we are far from perfect. The shift coordinators often have to quiet us down when the talk gets above the expected whispers or veers to inappropriate subjects -- no dirty jokes, just inappropriate subjects like politics or making light of sacred things. Or stupid jokes. There are those that annoy, unintentionally, but some retired doctors and lawyers, or even former church leaders, can't let go of their former prestige or even less desirable attributes. Which is why I try so hard to be unobtrusive and stick to talk of missions and family history. All in all, it is one of the greatest blessings of my life. I thank my former bishop who encouraged me. I look forward to Temple assignment nights. It calms me. It helps others. It strengthens my endowments of power from on high.